Big dogs legitimize big lawns — at least when they’re young, their owners live in a city or suburb, and you leave out the little issue of water conservation. My dogs, one of whom is in the category of ‘big,’ are now older if not old. They don’t run around as much as they used to on the big lawn in my back yard. Pretty soon, when they “go off to college,” as I prefer to think of their inevitable demise, I’ll have no excuse for maintaining my water-sucking sponge of a lawn. Hence, I have begun to plan for the future. I’ve long wanted to grow vegetables, but the prospect of digging up even one third of my lawn and conditioning the soil was daunting. I envisioned weeks of arduous work that I would never finish. A friend who raises organic flowers to sell in upper Michigan mentioned “lasagna gardening” to me. Or, I should say, she recommended googling it so that I could learn about it myself. Not only did I take her recommendation and find simple, clear explanations like this one, but, as a result, I bought Patricia Lanza’s Lasagna Gardening and thought it was worth a try. The principle is simple. Instead of digging up the lawn, I could create a 2-foot high bed of layered organic material right on top of the grass and let it “bake” or break down into enriched soil over a couple of months. What’s more, according to Lanza, I’d be able to plant vegetables on the same day that I created the bed. A little skeptical, I have decided to give it a try and record my efforts here. My first step was to turn off the sprinkler that covered the back half of my lawn. The grass there began to die at the beginning of September. First, I saved all newspaper pages that did not have any ink except black on it (to my surprise, easier done with the New York Times than with our local paper). Second, I asked the man who cuts my lawn each week to put all grass clippings off to one side of the yard for keeping. I became super diligent at picking up my dogs’ manure, which friends tell me should not get chopped up into the clippings. I suppose it has to do with what’s in dog food. 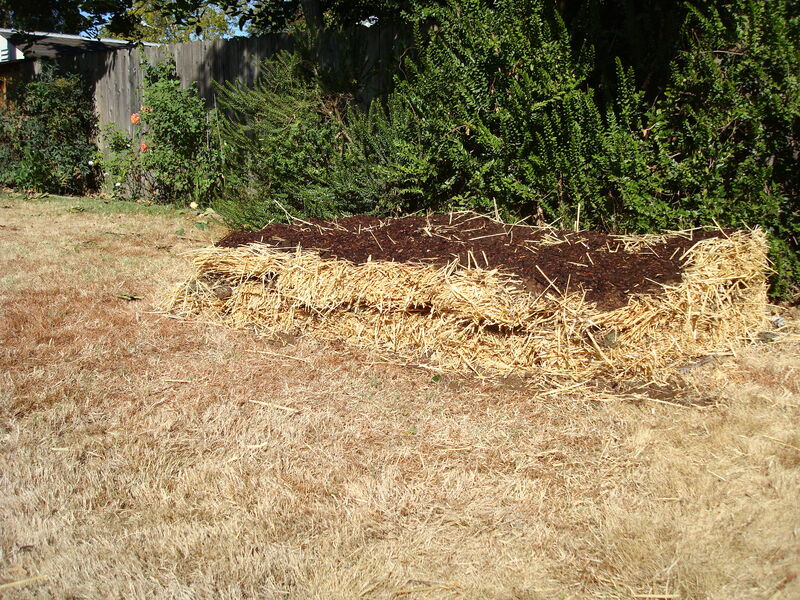 Third, I acquired several bales of straw ($7 – $9 each). Fourth, I bought two 3.8 cubic ft bags of peat moss ($18 each). Fifth, I bought two bags of cedar bark mulch to top the layers off. Sixth, I got a really, really big sheet of black plastic to cover the bed at the end (in fact, it’s so big, it’ll cover an entire second bed that I plan to lay down next weekend. But I had other options, although less convenient for me. 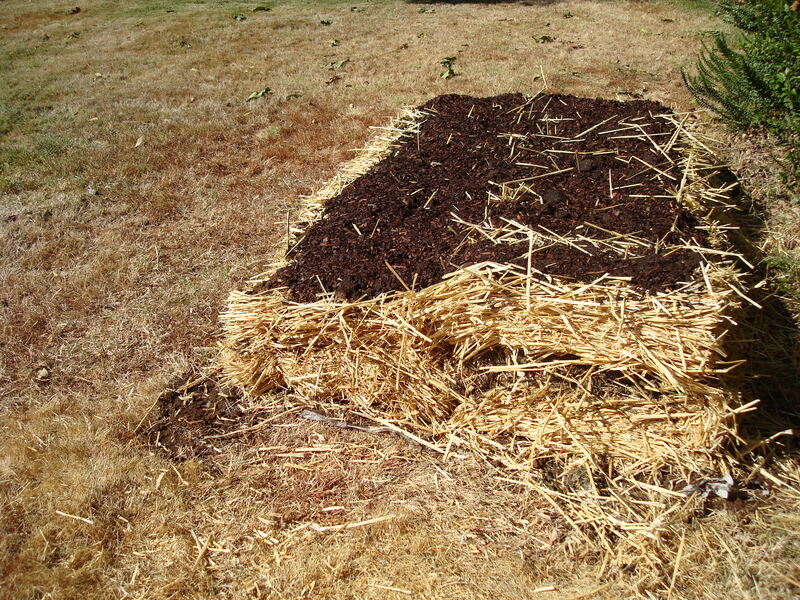 Lanza allows cardboard instead of newspaper as the base and chopped leaves, compost, barn and littler for use as layers. She tops off her lasagna with bonemeal and wood ashes for phosphorus and potassium. As it happened, the only reason I waited nearly two months to put down the first bed was that I was out of town. I had plenty of newspaper this morning when I got to work. Of course, it would be windy on the day I needed to lay sheets of newspaper across a 4 X 8 section at the back of my garden. Having my garden hose at hand helped. After I placed several sheets down, I sprayed it with water, which helped to weight down the paper and prevent it from flying up. I covered the 4 X 8 area entirely with about 5 or 6 sheets deep of newspaper, making sure that it was well sodden. On top of the newspapers I shoveled peat moss about 2-3 inches thick. For the next layer, the straw bales nicely came apart in about 4 inch thick slabs, which I positioned on top. Another layer of peat moss, followed by grass clippings, another of peat moss, another layer of straw, one more of peat moss, and then I capped the square mound with cedar bark. Lanza doesn’t say anything about watering the square before covering it in plastic, but I did anyway. The climate of northern California necessitates hosing down the compost box once a week, so I figured this could use a spritzer, too. Once I had taken my photos of it for the blog, I covered the whole thing in black plastic and dropped concrete blocks on the corners. So far, what I like about this method is that I can lay out and arrange my beds gradually. I have designed in my head how I want to arrange the vegetable beds across the back width of my lawn. The one detail I will change next week is to make the bed narrower. I will extend the bed I created today, but decrease the width to 3 feet and lengthen it to 9 ft. Because it will be the bed farthest from my house, I will plant in it the highest vegetables, like tomatoes and beans. Since I’m a complete novice at gardening, I welcome all advice, tips, and warnings.